Pete Mackanin as manager – The guys like Pete and he is smart baseball man; I think he will do as well as can be expected with a team full of average players. 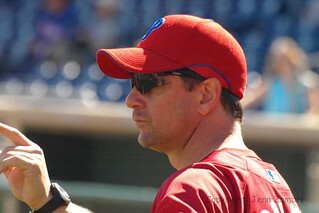 Micky Morandini as the new first base coach – A welcome blast from the past. The end of the Domonic Brown experiment – I was really at the end of my rope with this guy. Sorry, he will not be missed. Ken Giles – Seriously, Giles was the ONLY reason I though watching the 2016 would be bearable, and now he is gone. Who else am I supposed to root for (maybe Aaron Nola)? And this is a clear sign the Phillies are still many years away from competing. No more Jeff Francour? WTH? It is not official, but with the addition of so many new outfielders, one can surmise that Frenchy will not be back. He was the only other entertaining guy on this roster…boo!! We are still stuck with Ryan Howard’s salary – I don’t mind Howard himself, I just wish the Phillies didn’t still owe him like a bazillion dollars. New GM Matt Klentak – I thought this was a good idea until the Giles trade, which reeks of a move Ruben Amaro Jr. would have made. Is this younger, hipper guy just Ruben 2.0 in disguise? That may be a bit harsh; we shall see. New President Andy MacPhail – I hesitate to be excited about this because of the above mentioned issue with Klentak. But also, frankly, because the guy’s name includes the word “PHAIL (fail).” Not to mention that MacPhail has not seen any major success since the Twins won the World Series in 1987 and 1991. Everyone picked up in the Ken Giles trade – these do not appear to be impact players and could be a waste of time. Adding Peter Bourjos (wait, who?) – Outfielder Bourjos hit .241 in two seasons in the majors. The signing of 32-year old righty Charlie Morton – meh. Good synopsis of the offseason. I have ambivalent thoughts about the Dodgers offseason too. I’m actually liking the starting pitching rotation. At least, it will be something different.